The club has now introduced an online booking system.It is similar to the long standing diary system in current use. Members should have received a user name and password to access the court booking system. The password (but not the username) may be changed by the member. Members may access the booking system on the computer in the club entrance OR by clicking the green button on the right. This opens a log in page where they should enter Danbury and their username and password. A screen will appear with options to select a date, view all courts and bookings for the selected date or make a booking for that date by following the on screen instructions. You can also delete your own bookings and change your password from the personal details page link. Courts may be booked from 0001 seven days in advance. 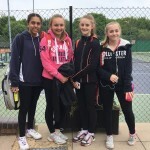 Massive congratulations to the U14 Danbury Girls who won their first Aegon match today. They were pushed hard by a young talented Connaught team. Good luck to both teams in their next fixtures!